The PDE announced this week that the annual TPES (Teacher and Principal Evaluation Survey) for the 2017-18 school year is due February 15, 2019. According to state regulations, this year’s TPES report includes additional data related to a new calculation called the ESSA Effectiveness Rating. 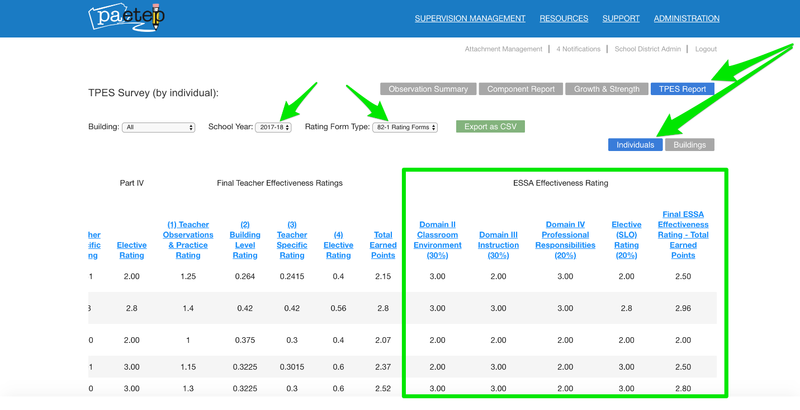 To support districts in calculating and reporting the new ESSA Effectiveness Rating data, EDULINK has improved PA-ETEP’s TPES report. To access PA-ETEP’s TPES report, log into PA-ETEP –> Administration –> Reporting –> TPES report. Please note that there are two tabs on the TPES report. The TPES Individuals tab provides individual teacher ESSA Effectiveness Rating calculations (scroll to the far right). The TPES Buildings tab provides aggregate totals, including the total number of teachers considered Ineffective and Effective by building. According to the new calculation, teachers with an ESSA Effectiveness Rating calculation of (0.00-1.99) are considered Ineffective and (2.00-3.00) Effective. For more information related to the PDE’s TPES report and the new ESSA Effectiveness Rating, visit the ESSA Educator Effectiveness Video Explanation and/or visit PDE’s Teacher Effectiveness Website.